Some of my recent favorite photos from 2005 and also 2004 are shown here. Also see my favorites from 2006, and page 1, page 2, page 3, page 4, page 5 and page 7 of my favorite photos. In addition, I have a lot more photos from the Appleton area, which are linked from my Appleton, Wisconsin page (see, for example, my Appleton Christmas Parade photos). 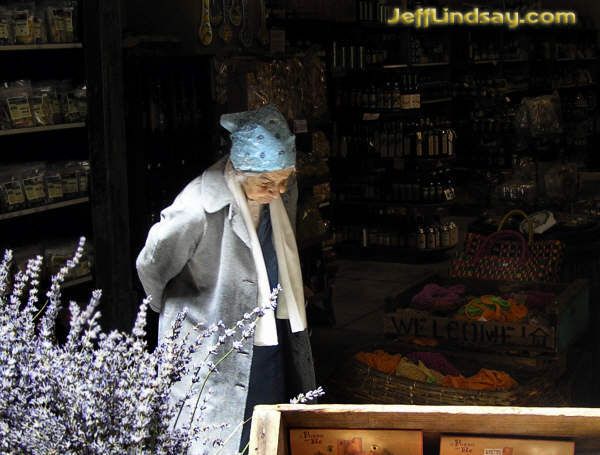 I've also got several pages of Lindsay Family Photos (the link is for 2005, and has links for each year back to 1999). 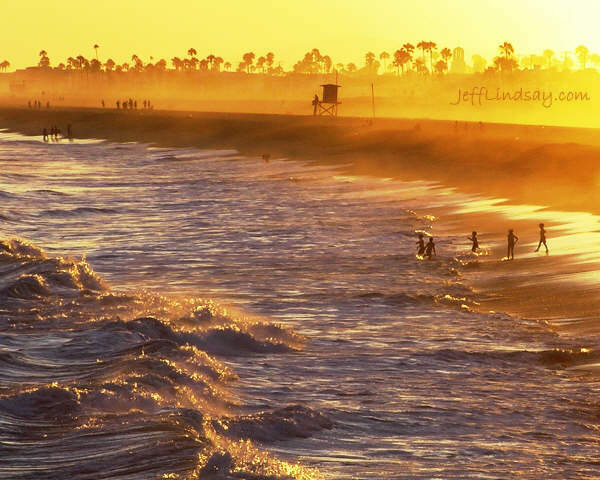 Boys playing in the surf at Newport Beach, California, June 2005. I took this photo from a pier using an Olympus C-725 Ultrazoom camera. It's one of my favorites. 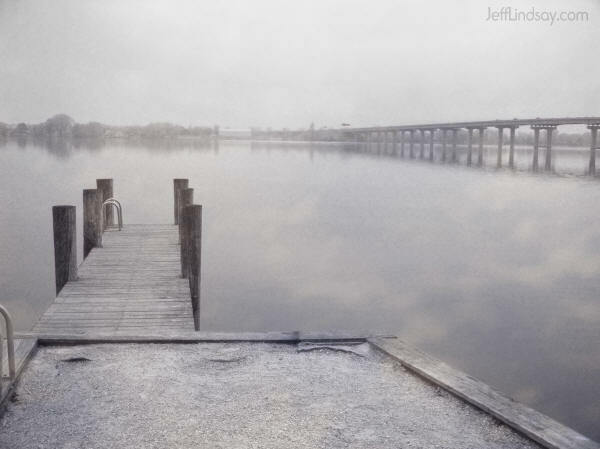 A view of the 441 bridge over Little Lake Butte des Morts near Appleton, Wisconsin, on a misty day, May 2005. 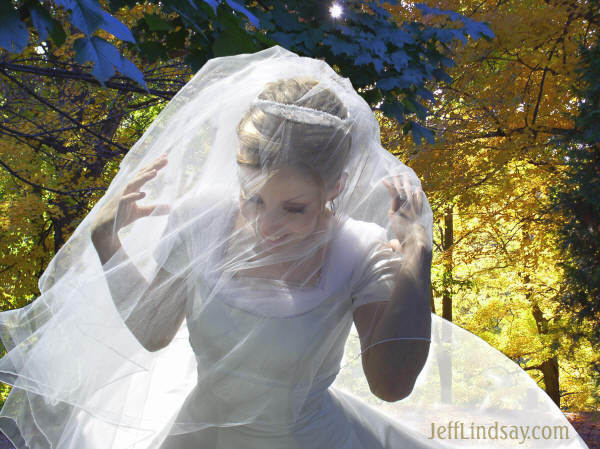 A wonderful friend of mine, Julie, in her wedding dress, Oct. 2004. I changed the background from a parking lot to some trees near my office in Neenah, Wisconsin. Another view of Julie from her wedding, again with a modified background, courtesy of yours truly. 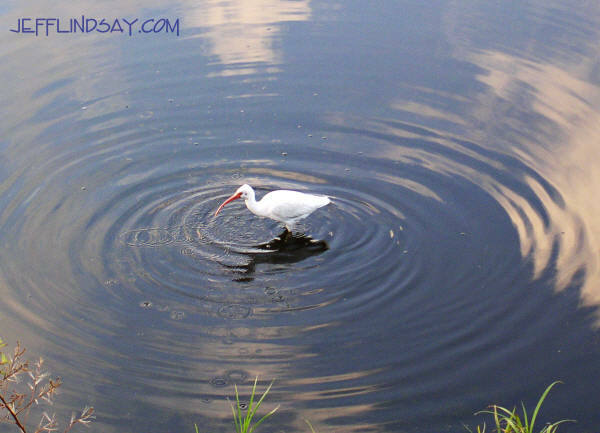 A bird in a pond in Orlando, Florida, Jan. 2004, photographed from my hotel parking lot at the Wyndham while I was on a business trip. 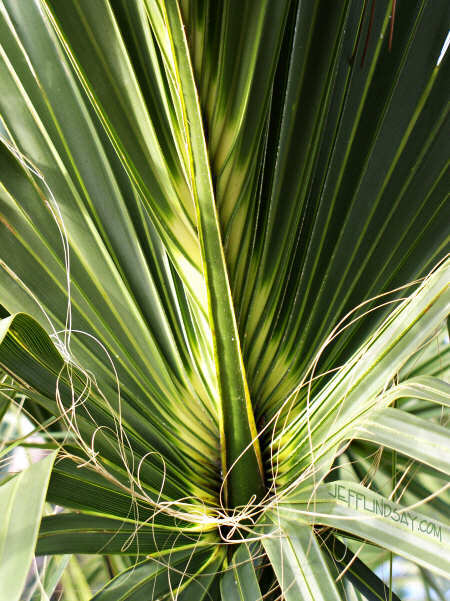 Palm leaves from a tree in Orlando, Florida - next to my hotel on a business trip, Jan. 2005. Photographed from the second floor. 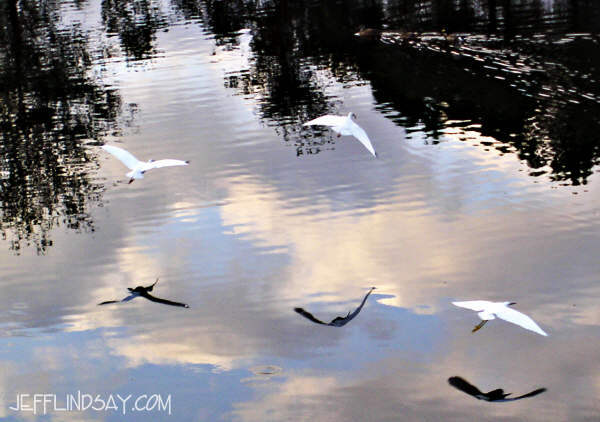 Birds glide over a still pond in Orlando, Florida - again, right next to my hotel parking lot at the Wyndham Hotel. 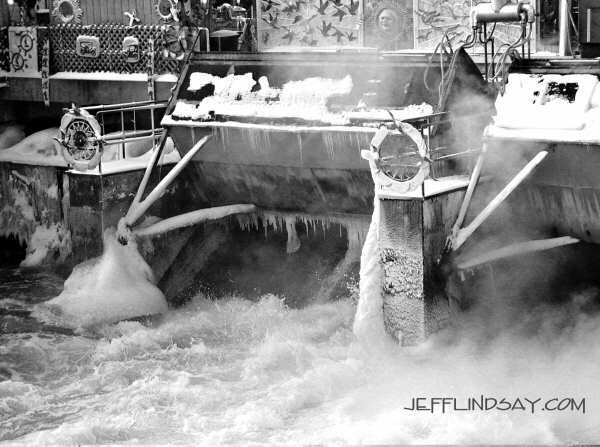 A historic dam on the Fox River in Appleton, Wisconsin during winter. 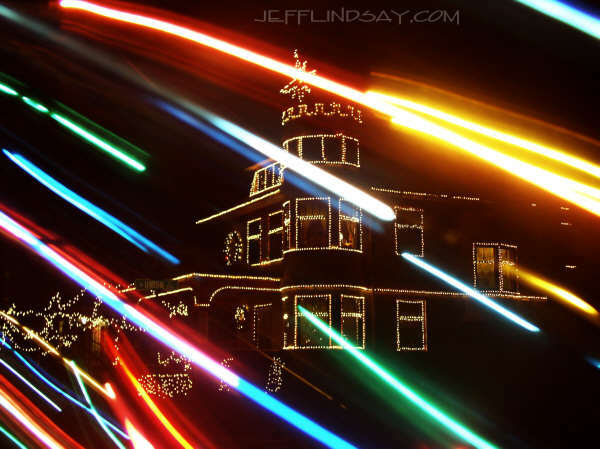 Photograph of a lovely home in Appleton with Christmas lights - superimposed with the image of some blurred lights from a Christmas tree. 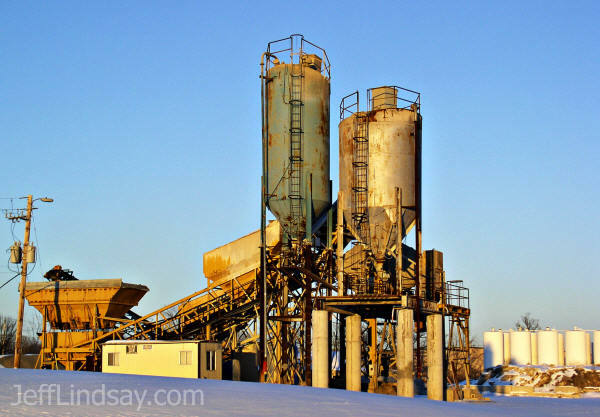 A processing site near Appleton. 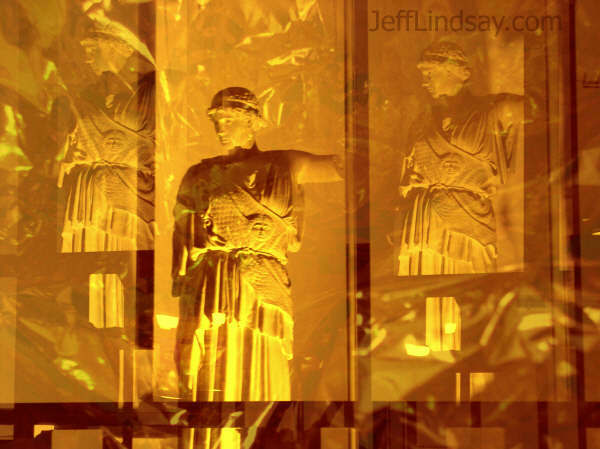 Nightime view of a statue in the art building of Lawrence University, slightly modified to show additional reflections. 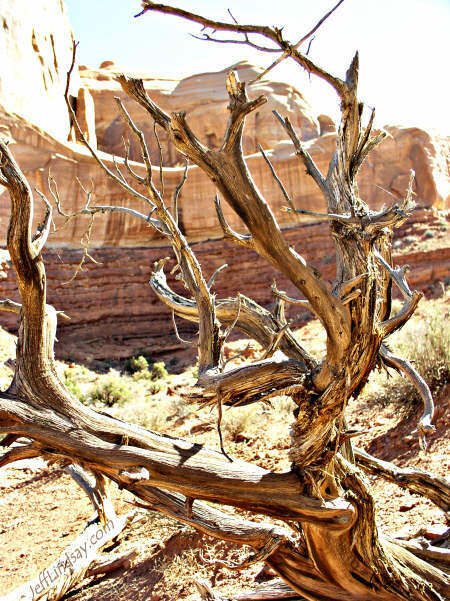 A twisted old tree at Arches National Monument near Moab, Utah, which I visited October 2004. 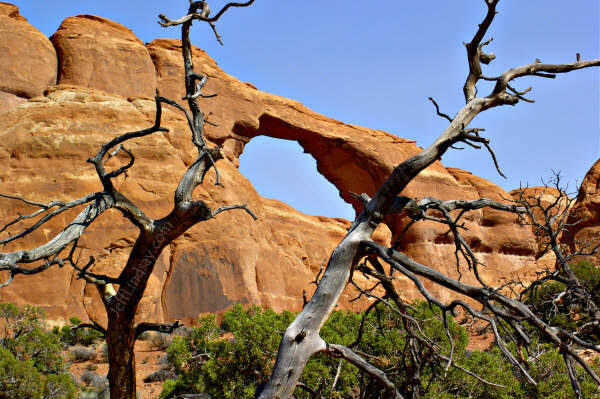 One of many arches at Arches National Monument in Utah, October 2004. Julie and Dave at Lake Winnebago, High Cliff State Park, 2004, while still engaged. 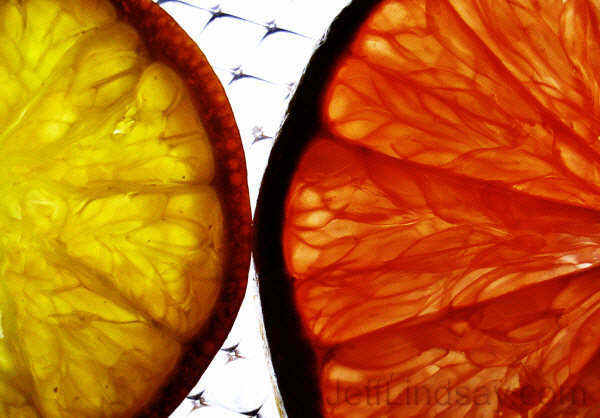 Cross-sections of orange and grapefruit, taken on a plastic backing with backlighting from an intense lamp. 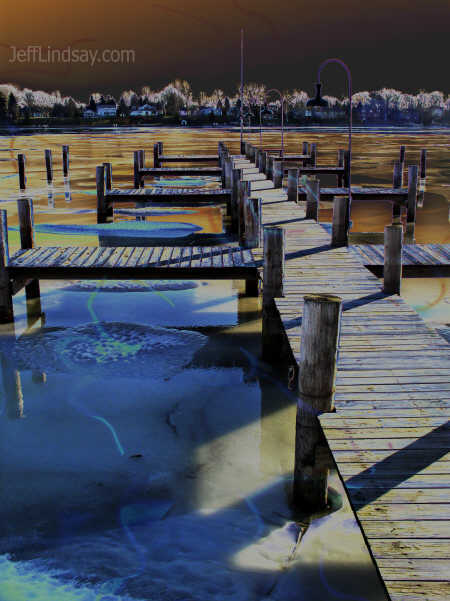 A dock in Appleton on Little Lake Butte des Morts, with some modified colors for a strange effect. 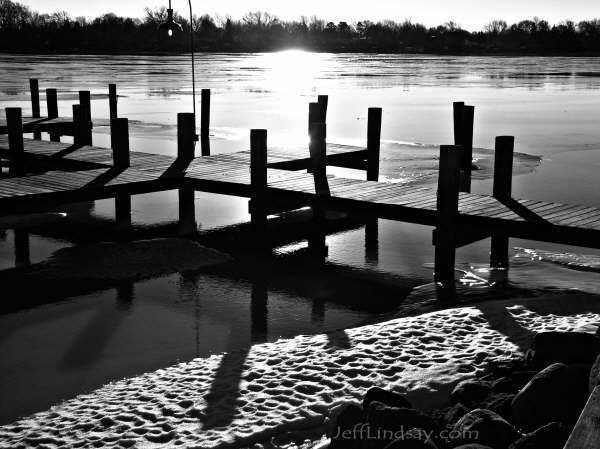 A nearby dock in Appleton on Little Lake Butte des Morts. 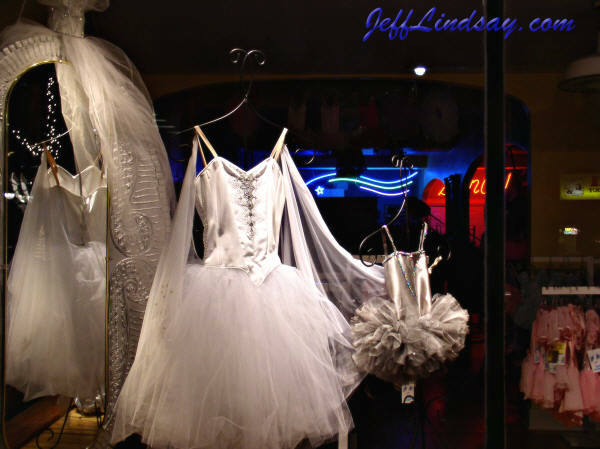 Dress in a store window of Appleton. 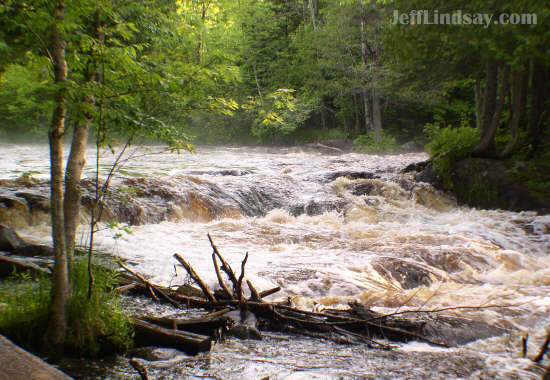 The Peshtigo River in northern Wisconsin, taken on a white water trip with my son, Benjamin, in 2004. 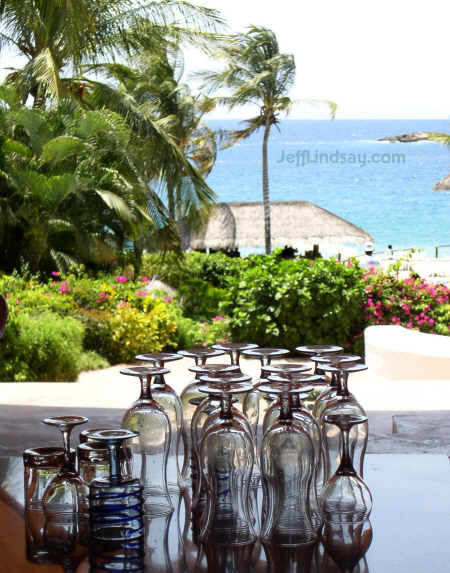 A scene from the Camino Real Zaashila hotel on the coast in Huatulco, Mexico. March 2005. 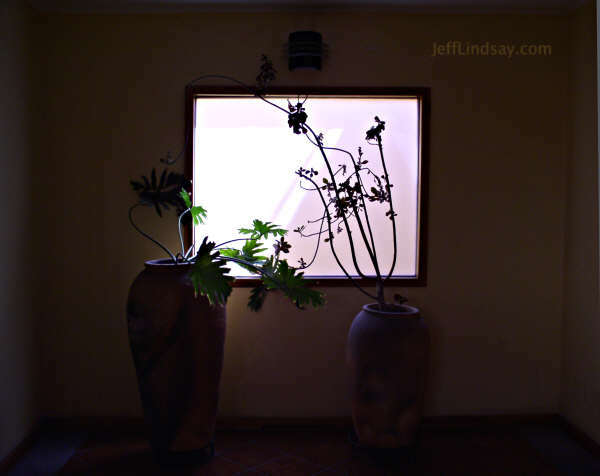 A window in the Casa Cue Hotel in Oaxaca, Mexico, March 2005. 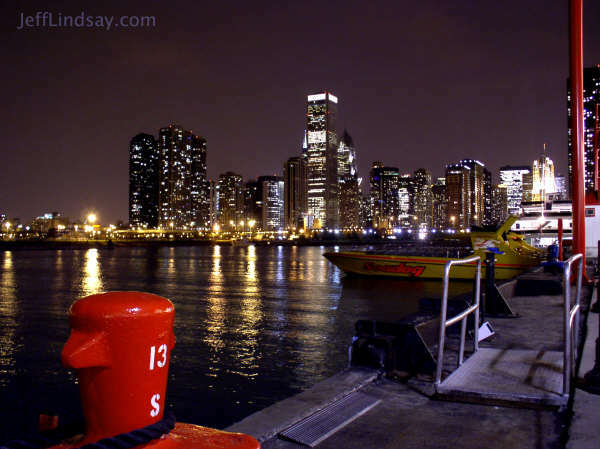 The Chicago skyline from Navy Pier, April 2005. 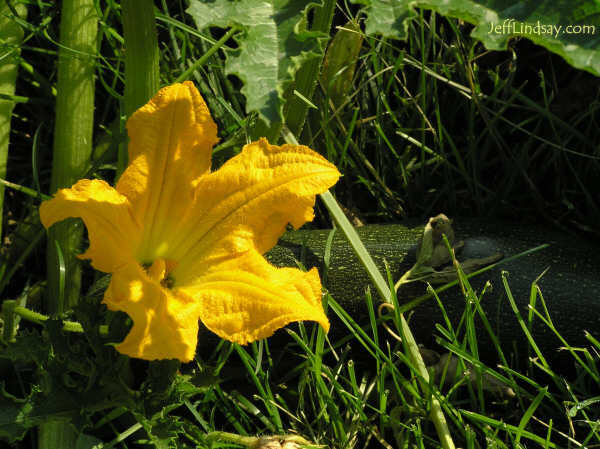 Zucchini blossom, Lindsays' backyard, Aug. 2005. 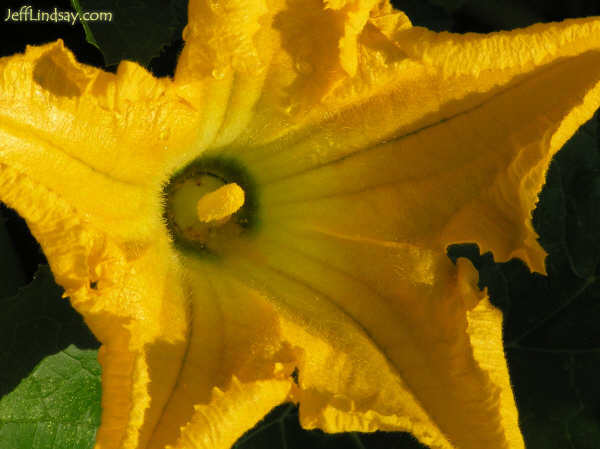 Click here to see another view. 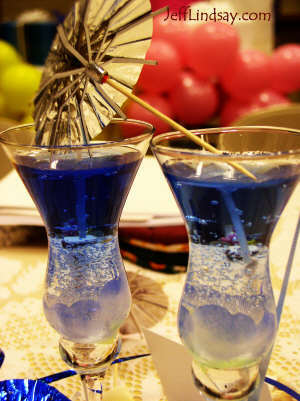 Two candles at a wedding reception. 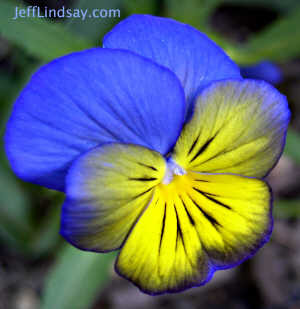 A pansy in a garden by the Smithsonian in Washington, D.C., April 2005.